rocky's bru: Ah, Ku Li! "Today we have a President of UMNO, a Chairman of Barisan Nasional, and a Prime Minister. What we lack is leadership." - Tengku Razaleigh Hamzah, in a speech tonight. 43 divisions in the bag? In today's mypaper, I wrote about the Gua Musang Umno divisional meeting that starts at 10 this morning. I did not have time to add the quotes above, though (Ku Li was speaking at a Sekolah Menengah Jeram Tekoh in Gua Musang last night. I have also just been told that Ku Li has the expressed support from 43 divisions as of last night. "I have my style of doing things. It is the will of God that I am entrusted to be the PM and only God can remove me". Well, my comment is if you invoke God, then He will certainly do the right thing! Common, lets stop trumpeting about politicians still getting stuck in a rut. What can you expect from a politician shaped by party policies that are based on RACIST AND RELIGIOUS SUPREMACIST AND BIGOTRY? Rocky, are you a die hard fan of Ku Li?? Seriously, Ku Li is no longer relevant in politic, he should just retire!! Even if he is our next PM, can he bring in foreign investors into Malaysia?? He is just another 'jaguh kampung' inside the tempurung named Malaysia. I would rather choose Anwar as he has a wider link with the world politicians. During this globalization era, we need some one who can bring in investors, not some one who drive them away like our stupid Abdullah!! CIA spy, Israel spy and etc are all sort of crap stuffs thrown by UMNO and TM to destory Anwar image. Do not forget that Anwar was one of the candidates for the Sectary General of PBB! That Korean guy should be lucky as Anwar turn down that job to focus in the election. That is enough to show Anwar's value in the eye of the world! Always remember, the world DOES NOT orbit around Malaysia, we are the one who MUST FOLLOW the flow or we will be left behind. DO NOT think so highly of ourself as we are not who we are today if not because of those foreign investors who invested in our country long before we even achieved our independent. We still need them!! Boy is he coming out strong, guns blazing. Lets hope he hits the target. And don't run out of bullets. Maybe he can be advised to start his own blog. The longer the Sleepy Head stay on as PM then the better for the opposition. If Ku Li comes in and knock him out then it is no good for the opposition/Anwar. So it all depends from which angle you are looking at. Personally for the sake of Malaysia, we need Ku Li to revive. The Sleepy Head should go to sleep forever with Jean and this is the best for Malaysia. This sleepy Head is screwing Malaysia big time. PM is also a role model for the ex-Sg Siput old man. This loser says same things like PM! "I have lots more to do for the Indians"
"I will talk to the government for release of Hindraf 5"
"I will only leave MIC leadership if voted out"
Those who have the files on this MIC chap shud start opening it and take action on some of the serious cases for which evidences are available aplenty. Got to do it now, instead of going after the Penang CM. But the government's civil servants got no independance to take any action? Di Malaysia Boleh or Di Malaysia Tak Boleh? Anyone is better than AAB..except maybe a few people like ijok monkey..krisman..tunnel MP..
Not only do we not have leadership--the country also has a sleeping , wishy-washy and stubborn old fool who doesnt know that he has already out-lived his welcome !!! I guess beggars cannot be choosers. After this badawi fella, anything or anyone , MUST and HAS TO be better. Oh Malaysia my country ! This is not a scientific study or a well researched claim but just a hunch, I don't think Ku Li will be PM. Somehow I feel that he is cursed not to get that post. KuLi itu apa bezanya. Dua kali lima saja. Ideologi UMNO tetap berdasarkan kaum dan agama saja. UMNO memerlukan perubahan mentaliti dan prinsip, bukan perubahan pemimpin saja. Kalau cara dan gaya parti tu tetap sama, apa beza kalau KuLi atau Badawi atau Muhammand Muhammad Taib atau Zaid Ibrahim pun menjadi presiden UMNO? The chairman of BN, is also the President of UMNO, who is also the Prime Minister, who is also the Finance Minister, who is also the Chairman of many many sub committees and councils. Why do we need one person holding so many positions ? Can he really handle all this on one plate. Malaysia must introduce the one person one position policy. Look at Samy, since he is no more it Government and does not owe AAB anything, he can speak up bravely on the plight of Indians. In India Atal Behari Vajpayee was PM but he wasnt the President of BJP. Like wise now no doubt Sonia Ghandhi is the President of the Congress Party, Manmohan Singh is the Prime Minister. George Bush is not the leader of the Republicans, but he is President of USA. So one man one post is the better that one man, many posts. Anwar?? I supported Pakatan Rakyat... but to give too much credit to Anwar... this Kean fella must be sleeping like Badawi la i think. The problem with UMNO, even after 8 March is that it sees Malaysia in its racist forms. They have yet to start talking about anything that might undermine their special privileges, ketuanan Melayu, their religious supremacist bigotry or anything that might just accomodate any kind of balance between races, whether at civilian levels, political levels or even uniformed levels. As long as they are trying to reform with these tenets in place, I say damn you UMNO. You best serve the nation under Badawi who shall lead you to damnation! as long as any other proferring themselves as potential saviours of UMNO, I also damn their bid to leadership of that eveil organisation as that is what we do not need anymore. yea, Anuar can sell malaysia well, including you & me. Kean, you are right and you are wrong. You right about ku li but he is an umno member and wrong about anwar he is not an umno member. i am declined to say that Ku Li wants to be PM for the sake of finally achieving his dreams!! Before UMNO can reform it must carry out a root cause failure analysis. But it is so obvious that the conclusion from PRU 12 is that Pak Lah has utterly failed to lead UMNO and BN. Before any reform or rawatan can be made the cancerous tumor that is pak lah and his close advisers has to be removed surgically before and medicine can be administered to good effect. Ku Li is the man of the hour, he is the surgeon UMNO needs to get rid of the cancerous tumour. UMNO grassroot should support him. I say Ku LI for President of UMNO,Chairman of Barisan Nasional and PRIME MINISTER. God Bless Malaysia. Putera -- any Mat Rempit will do. Ku Li is regal and experienced. He has paid his due. Rais is intellectual, affable and effective. Let's break away from the norm. seems there's Pak Lah cybertrooper, Ku Li @ Umno reformist supporter and pro Anwar voters on this topic. It's actually an interesting topic to be discussed openly. My rational is between sleeping Dollah, season Ku Li and opportunist Anwar, I have no oother choice but to choose Ku Li for the time being. And he's better than Najib. Remember that Najib's ex wife is Ku Li punya anak saudara - if I'm not mistaken. This is the most suitable time from anyone from UMNO to take action against the lackadasical PM. Ku Li, may you have the strength to save your party against further destruction. I hope many in UMNO grassroot level wake up and give you the thunderous support in your journey to "clean-up" UMNO. I used to be UMNO supporter, only voted for Opposition during the last election because I feel BN have a very very weak leaders as well as many surronding PM seems to be now irrelevant and just wanting to enriched themselves. May the Opposition lived up to their promises and I really hope to see many of the ministers and those linked to them go to jail for their wrong doings. We hope that we can also recover all the monies taken by these "evil blood suckers"
it's meaningless to kick Pak lah out before doing a post mortem to find out if he really was the cause why BN was uprooted. may be there were other cause like the Keris issue. Why must Pak Lah resign if Hishamuddin was the cause ? Doesnt make sense does it ? Ku Li & his team better act faster or otherwise Anwar will hijack everything. Sang Kelembai: Dikisahkan oleh setengah orang yang berjumpa Abdullah Hj Ahmad khasnya dari Perlis bahawa dalam percakapan dan meminta pertunjuk selepas kekalahan UMNO/Barisan Nasional maka berkata Abdullah Hj Ahmad bahawa, kalau susah-sangat sangat dia letak jawatan dan biarlah diganti oleh Najib dan jika Najib tak boleh bagilah kepada Anwar Ibrahim. Oleh itu ahli Majlis Tertinggi UMNO elok lah bertanya apa pakatan Pak Lah dan Anwar Ibrahim. anwar ibrahim for PM? think long and hard before you decide. why is pkr's logo like that? only one eye? who else is associated with one eye? muslims.. does the name dajjal sound familiar? what we have here is a big idea, a new world order (taken from bush sr.'s speech tp congress many moons ago). dont let emotion get the better of you. we need a good leader for all malaysian. dont just simply pick someone because he was jailed or fighting against the current government. know your leaders first and familiarise yourselevs with their backgrounds, policy, associates, etc. there are all kinds of evil in this world today. they come in many different shapes, skin colour, religion, race. This is a classic battle, which has lasted for thousands of years and it will continue until the end of all life. It is the meaning of life. 43 nominations against one only the last round. look like bare fangs fight is just around the corner. hope it wont be "gajah lawan gajah, pelanduk mati di tengah", eh? As far as UMNO pilitics goes, there is precious little for the man in the street. He picks up the crumbs if he is lucky, and the bill if he is unlucky. UMNO doesn't care a damn, nor does BN. They are just busy looking to line their pockets. To call Anwar is an opportunist (maybe that is true) is to condemn each and everyone in line to succeed Pak Lah as something worse. At least Anwar has had his baptism of power, although we must remember, it was UMNO, the police, the judiciary and the government that was ultimately smeared, just for the sake of keeping Mahathir in power... and finally we see Anwar rising from the bashing he has had to endure, because the rakyat saw the whole episode for what it was. Between the choices we see, I do not think that we can do any worse than Ku Li. He has had his tests in his career as well, and he is not as tainted as any of the conspicuous personalities on parade for the UMNO AGM this year. Compare him with the likes of Najib, Khir, Khairy and the rest, he has so far managed to stay above UMNO's scum line thus far. That counts for a lot where credibility is concerned. 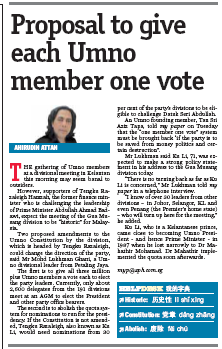 But I do not think that is foremost on the UMNO delegates' minds when they vote. It's the brown envelopes and stuffed suitcases that counts. Anyway, what was he doing at a school? I thought politicians were not welcome there? If Ku Li is so good, he shouldn't have just holed up in his Fox Cave all this while. Should have stepped up to return Kelantan back to BN. At his age, he should have long handed Fox Cave to a younger successor. Unfortunately, old man still gila kuasa. Longest serving MP in Malaysia.. What a record?? KU LI for PM...will be good for the people of Kelantan. Are you a retarded son warded in a mental hospital? You must be a buffoon beyond salvation point. It is interesting that your ilk has the temerity to write such bunkum in their desperate attempt to teach us what and who is good and bad. God the Almighty! Try again. You have utterly failed in this one. At least if you would like to discourage us against something or someone, you need to be smart, not a silly retard blabbering about "eyes" for logos. Then in your silly concoction, you ask if the "eye" is related to Muslims. Ha ha ha! God the Almighty! Your case is heartrending indeed. You wrote: "don’t let emotion get the better of you." Do you see any irony here? Not only are you emotional, but painfully shortsighted and less informed. Your heart is constricted and your political persuasion is purely feudal. No wonder you are living in Stone Age. Concerning Bush, I think we need to take Mahatir to task for paying millions to Jewish lobbies to have a photo with Bush. Look here, to meet Bush is very good. Meeting your enemy is very important. Making him understand your cause and case is significant, I encourage that, but we need back the money paid to the Republican lobbies since the lobbyist has ended up in prison for taking millions from Mahatir for a Bush photo. You said: "We need a leader of all Malaysians...", then who is that? You should know the difference between an argument for a case/person and the reality in general. As a Mahatirite, you should free yourself from the shackles of feudal mentality and manipulative culture that thrives in innuendos, anguish, lies and cheap shots. For Tengku, Ku Li is not a Malaysian leader. Wasn't he the one who has sent a letter to UMNO racists saying that Chinese and Indians are getting "political rights" and that PKR will soon get the PM position while DAP will get the DPM? Using racial politics as a ladder and fanning hatred for political expediency can't convince even toddlers. May be for Stone Age feudal pussyfooters of your calibre. Go and get a drink and have a sound sleep. umno is the huge circus ring where corruption wears boots, killing wears skirt, lies wear hat, stupidity naked, stealing rides an elephant and money walks on high wire. All this show is not meant for adults, only children. Soon, they will fade. After all, malay don't need umno, but umno desperates for malay support. a leader can come from anywhere. Kalau menang, saya bercadang untuk melantik seorang blogger di dalam majlis tertinggi. Personally, I think Ku Li is no longer relevant. Wait, wait, I know … how about Umno recall Mahathir? I mean, this is a time of great crisis, right? A most extraordinarily turbulent period in the party’s history; so extraordinary that it calls for extraordinary measures. And who more extraordinary than the Vanquisher of Royalty, Destroyer of the Judiciary, Master Designer of the Twin Towers, Patriach of Putrajaya, Scourge of Moronic Speculators, Pegger of the Currency, Deposer of Deputies, Smiter of Sexual Deviants, Father of Development, Saviour of the Malaysian Nation, Crutchmaker of the Malay Race, Overlord of Umno, Uber Melayu, Da Man, Da M, … (drumroll) … Doctoooooor Emmmmmm! Old Man, would you like your old job back? It is pertinent to look into Ku Li’s line of thinking when he invokes the fear of “loosing political control to non-Malays”. He theorises that Penang, Perak and Selangor are already under non-Malay control. He arrives at this conclusion by numerically adding the non-Malays in PKR to those in DAP in the respective state governments. This narrow interpretation of racial power is both illogical and unhelpful in forging racial integration. First, a party member’s first allegiance is to the party (where members share the same ideology), not to his race. It is the policy of the party that determines the treatment accorded to the various races, not the racial identities of the officers executing the party policy, for a member that strays from party policy cannot survive within that party. Second, these state governments are ruled by coalitions of PKR, DAP & PAS, where none has won enough seats to govern alone. So, policy decisions are, by necessity, consensus under collective leadership. In fact, Malays should be least worried of being marginalised under these coalition governments, for is it conceivable that PKR and PAS would allow Malays to be so treated? 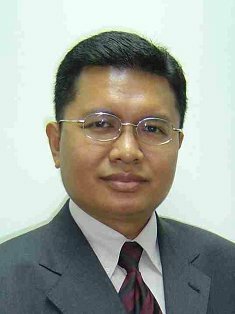 Ku Li has equated Malay power with UMNO, so in his logic, Malays loose political power when UMNO looses control of government. Why should it be so? Aren’t both PKR and PAS led and controlled by Malays? Is Anwar Ibrahim not a Malay? Is Hadi Awang not a Malay? Ku Li should know by now that nothing is for sure in UMNO. His challenge for the UMNO presidency should have thought him this lesson. I remember at one UMNO meeting, then, he confidently announced the exact number of divisions and delegates who were on his side. Rais who was with him at the meeting even tabulated the exact number of votes Ku Li would get in his contest against Mahathir. They were savouring a victory. My observation: UMNO delegates can be bought like goats at the market place. At least Pak Lah didnt help the opposition win over Penang, but Ku Li did just that with his Semangat 46 in 1990. Ku Li is a politician from the past who is trying to reinvent his image. He is trying to make himself relevant. he will surely fail because he is trying to play to the Malay gallery. He was never a racist, but today he is playing the racist card. Ku Li, you are dead and buried, you are finished. He is trying to brandish a new keris to stoke up his political ambitions. He is a politician behind the curve. It's too late. Times have changed. The political landscape has changed. The world has changed. But Ku Li has not changed. Yeah... with his eyes closed. That's not "open-leadership" lah moron, that's sleeping, ignorant, couldn't-care-less, brain-dead leadership.